If you are looking to setup a simple site or blog then you can use free services such as WordPress.com (not to be confused with the standalone WordPress content management system) or Blogger. However, these free services have limits on the amount you can customise your site, and in many cases if you require extra functionality you have to pay for it with a premium version. There are also so called free web hosting companies out there, which have additional risks and pitfalls to watch out for. 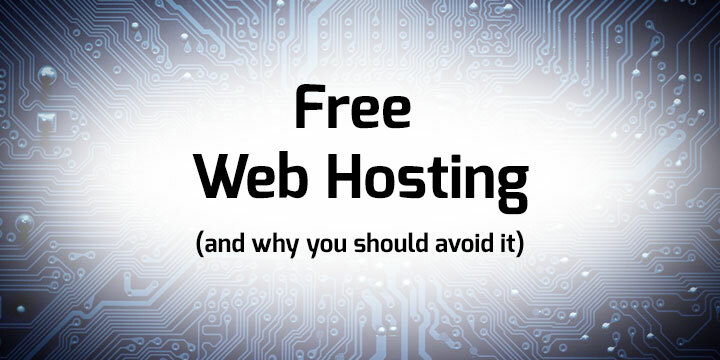 In this post we will be talking about some of the problems with free web hosting solutions. In the era of web 2.0 many websites are image heavy, with audio and video elements too. Even if you plan on starting a small site, you may run in to problems further down the road when you want to expand or add content to your site. You may also have limits on the bandwidth your site can use, which means that image heavy sites will load slowly. For example, Blogger has a total limit on image uploads of 1GB, with a maximum page size of 1MB. This may sound like plenty of space, but in the modern era with high definition imagery you would be surprised how quickly this can be used up. As your site develops, you may want to add functionality and features to your site. Many of the free options only have a limited number of themes to choose between, and they are often tricky to modify. Platforms like Squarespace can be difficult to modify, and your changes may get overwritten by any future updates. If you are fairly skilled at HTML and CSS then you stand a better chance of changing the look of your site, but there are easier ways of going about having a unique site design. A free hosting provider simply can’t afford to provide you with high levels of security. When the service is free you can expect corners to be cut. It’s likely that from time to time updates will break your site, data may be lost and technical support will take a while to get to your issue ticket. The free hosting solutions are perfect targets for malware and hacking attacks as well, as their users are likely to be using weak passwords. In addition, hackers may target the platform as a whole, and prevent your site from working that way. There are many factors that can harm your SEO as a result of using free services. Your website could be slow to load due to sharing resources with many other sites, your site could experience frequent downtime, your top-level domain may be hosted outside of your country and your site may suffer from database and caching issues. Many low-quality spam sites are hosted on free web hosting platforms, and if you are sharing that platform you can expect a hit to your page ranking too. Sadly, there isn’t much you can do to improve your SEO in this case. In some cases this can be as bad as your free hosting company disappearing overnight, taking your site with it. If you only looking to have a casual blog or a site that you want to do for fun, then a free hosting solution is fine, but if you are looking for a strong web presence or you are looking to setup a business online we strongly recommend choosing a paid web hosting company. Remember the saying, “if the service is free, the product is you”. Expect an increase in unwanted emails, and the possibility of your data being shared with third parties. Here at Unlimited Web Hosting our Web Hosting packages start from as little as £2.99 (ex.vat), if you would like to discuss your hosting requirements than please get in touch.